Why don’t more Pros use Nokona gloves? As you turn on the television to watch your favorite ball club battle it out for 9 innings, one thing there’s no shortage of is brand logos. From outfield walls to athlete cleats, a wide range of sporting good companies pay top dollar to catch your eye. Many house hold names like Nike, Under Armour, Wilson, and Rawlings are easy to spot, as the game’s best put them on every day. But one brand many baseball enthusiast may see missing, is that of the historic Nokona. Now if you didn’t grow up playing baseball or softball, you may not know who Nokona is. Specializing in premium gloves, you certainly wouldn’t find these gloves on a clearance rack at your local sporting goods store. But if you have grown up around the sport, than the name Nokona will more often than not be associated with quality and craftsmanship. This small company based out of Nocona, TX has been making baseball gloves for over 80 years. Since 1934, gloves have been handcrafted in the United States, emphasizing quality above all. Ask great Nolan Ryan about Nokona, and he’ll tell you the story of buying his first Nokona glove as a kid. What has separated this company over the years, from other larger brands, is their commitment to only make and produce gloves in the United States. The founder Robert Storey once said the day the he had to import gloves was the day he’d quit and go fishing. Gloves from Mizuno, Wilson, and Rawlings are all produced throughout Asia, and brought in to the US market. While this is no knock on their quality or performance, many put value on where their glove is made. Being a small company, Nokona has always fought for a place in the spotlight. In the early 2000’s, investors came to the manufacturer with hopes of growing the brand to a much larger stage. Efforts were made, and money was spent on endorsement deals with team and players. Things were looking up and the name began to circulate outside just those most enthralled with the sport. But then came the economic down turn, and with it went the cash flow. Struggling to stay operating, Nokona was forced to scale back all their marketing efforts. Nokona is now owned by parent company Cutters Sports. They specialize in gloves of a different kind, and can be seen on the hands NFL players every Sunday. But this new ownership has not changed the product, or where and how it’s made. 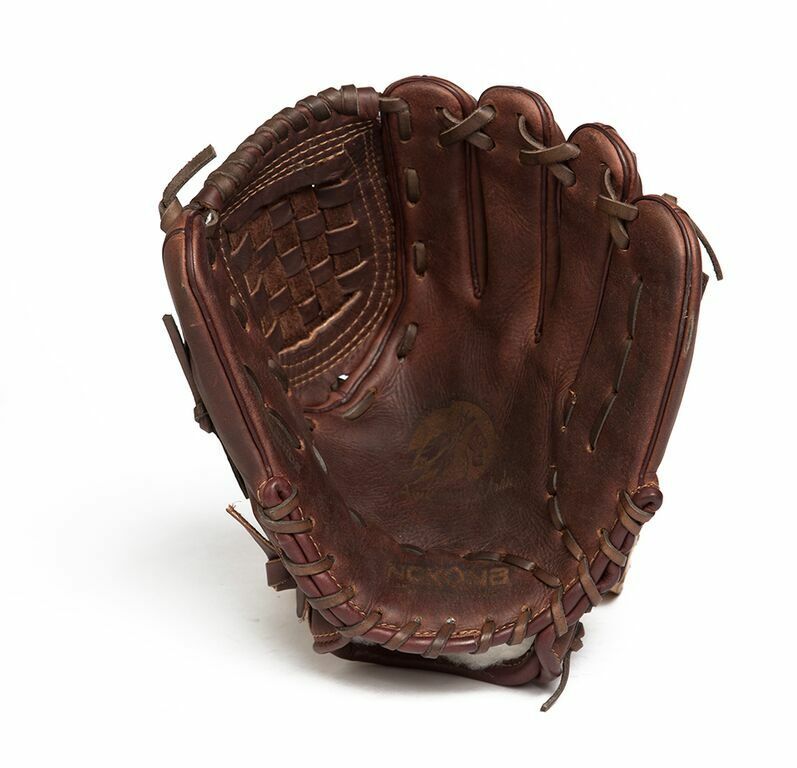 They continue to make a premium glove for all ages, using only American materials and labor. You will see a handful of up and coming MLB and Minor league players using Nokona gloves, headlined by Chicago White Sox second baseman Tyler Saladino and Philadelphia Phillies Pitcher Jerad Eickhoff. But it is unlikely you will see headliners donning the iconic Nokona Indian logo anytime soon, as endorsement deals continue reach astronomical figures. Instead, Nokona will stick to what they do best. Making great gloves in America, for America’s pastime. While you may not see many Major Leaguers wearing Nokona gloves, that doesn’t speak to their quality or performance. Ask anyone who has owned a Nokona glove, and they will likely speak of it as if it were a long lost love, rather than a piece of sporting equipment. Scroll through today’s forums, and you will hear the overwhelming praise sung by Nokona owners as they describe the quality felt every time you put on the glove. Making both softball and baseball gloves, the Nokona brand has won the hearts of many ball players over the years, and looks to continue to do so in the future. Nokona makes the best gloves on earth. Nothing like feeling a Nokona for the first time. Changes the game. Just bought my kid her first Nokona for a fastpitch catcher. I was sold on it when another parent showed me hers from 2o years ago who also used it in college. She had it with her at the park, and still using it to catch with her daughter that day. I hope it fits good and is used for a long time. I do understand the money I paid was probably too much, but this is already the third mitt I buy her. I do not want to keep buying gloves. The other reason I went with Nokona was because it is made here in the USA, and in Texas. Bad thing was I did not want to pay another 25% to put her name on it. Now I wish I did. Of course she would pick the X2-V3250 (Red, White, & Blue). She is very Patriotic.